Anyone who has turned over a rock or log anywhere on earth has probably seen these very common crustaceans. They live in almost every moist environment on earth, and eat decaying plant material. Their preference for moist environments is due in part to their lack of a waxy cuticle covering their body – they are very susceptible to desiccation (drying out). Most of the order Insecta have a waxy covering, hence their ability to exploit almost all ecosystems, regardless of moisture levels. 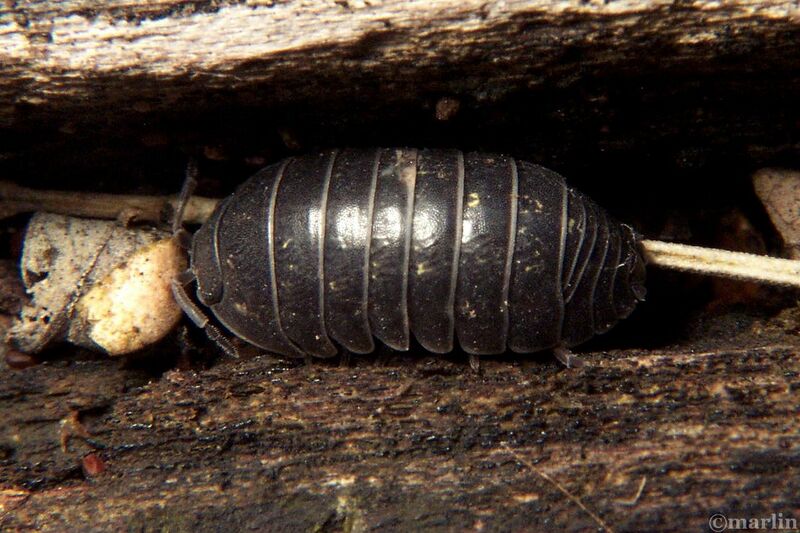 The only animals known to prey exclusively on woodlice are spiders of the genus Dysdera. However, many other animals will eat them, including toads, frogs, centipedes and millipedes. 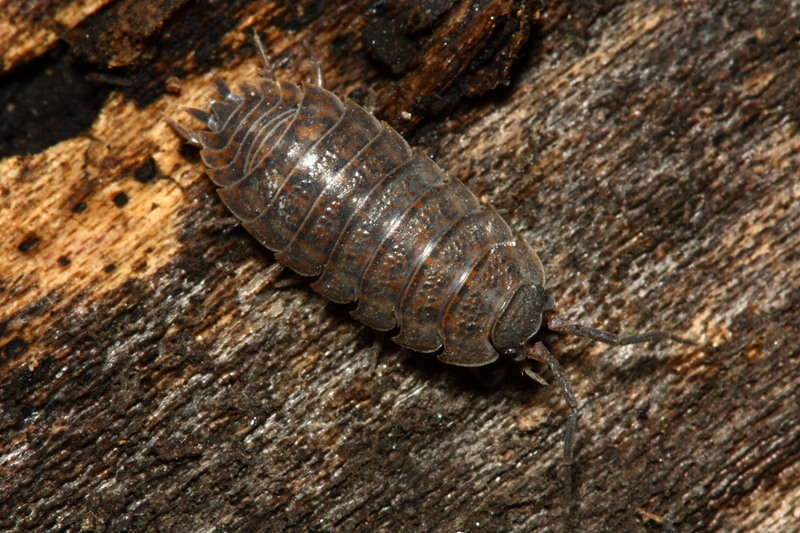 Pillbugs and woodlice are members of the subphylum Crustacea, which includes crabs, shrimps and lobsters. Most crustaceans are aquatic. Only two orders contain species which are able to live their whole life cycle away from water. These are the Isopoda, which includes the woodlice, and the Amphipoda. 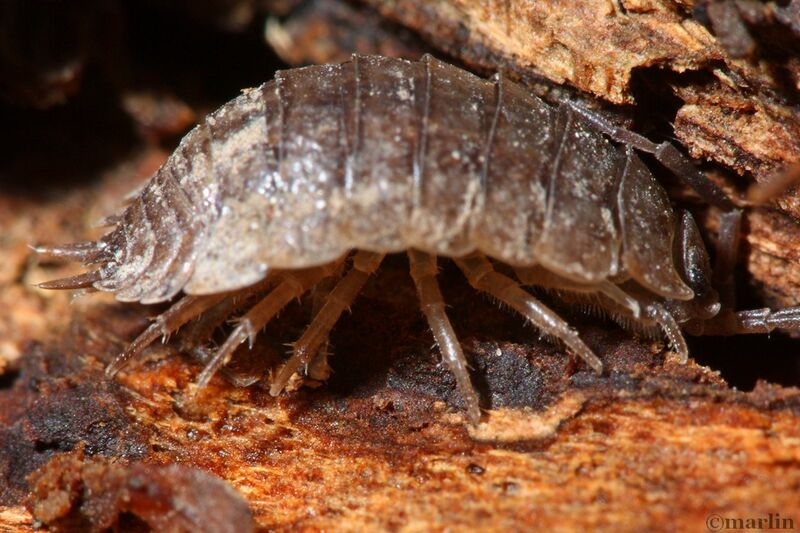 All isopods have seven pairs of legs which are usually of similar structure (hence the name iso-pod from the Greek isos meaning ‘equal’ and podes meaning feet). 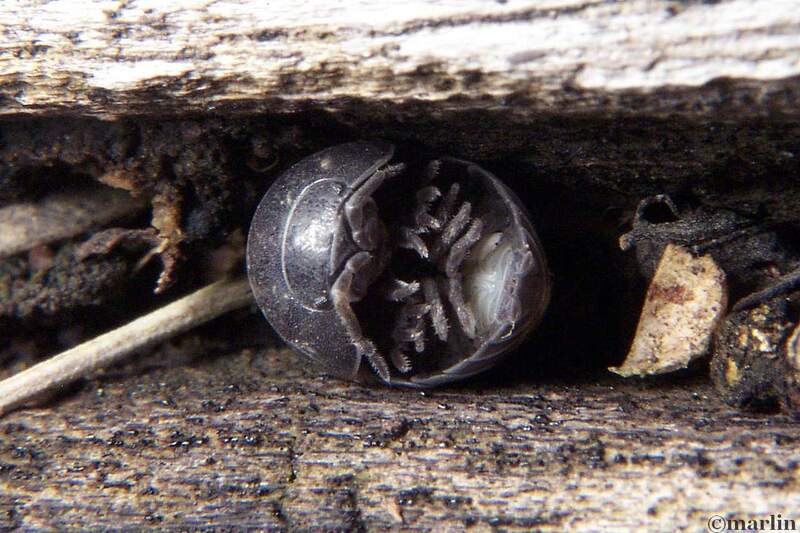 Woodlice babies (not shown), when released from the brood pouch of the female, have six pairs of legs. At this stage, they are called “mancas.” After the first molt, which occurs within 24 hours of release, the 7th leg bearing segment appears and after another molt they gain their full complement of seven pairs of legs and are juveniles. Juveniles molt at intervals until they reach sexual maturity. The molting process continues after maturity (although with less frequency) and involves shedding the exoskeleton in two parts. 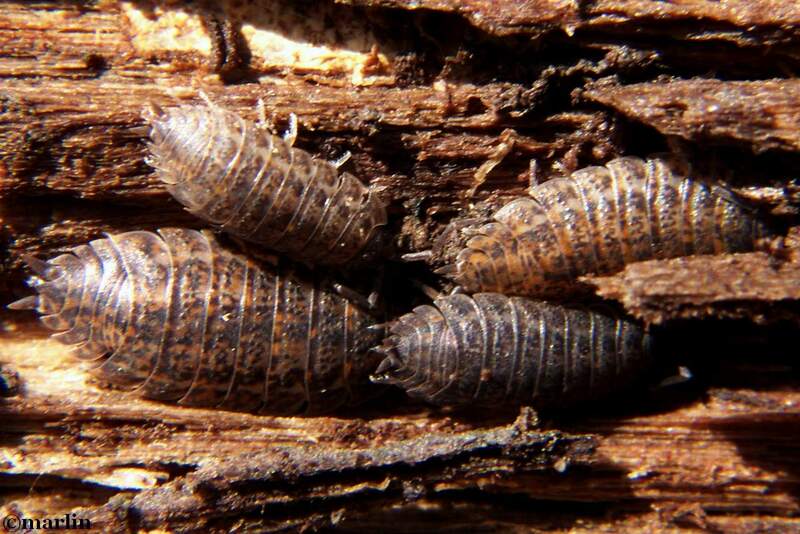 The presence of sow bugs or pill bugs in the living quarters of a home is an indication high moisture conditions. This condition will also contribute to a number of other problems including mildew, wood rot and a good breeding environment for other insects. Reduce moisture or humidity level indoors. Use bathroom fans, stove hood vent fans, vent clothes dryers outside. Crawl spaces and attics need to be well ventilated. Remove excess vegetation and debris around exterior perimeter of the home. Make sure that leaf debris (leaves hold moisture and hide the bugs) is cleaned up from around the outside of your house. Keep rain gutters and downspouts clean and in good repair. Instead of chemicals, use a caulking gun to close any cracks or crevices at or near ground level. 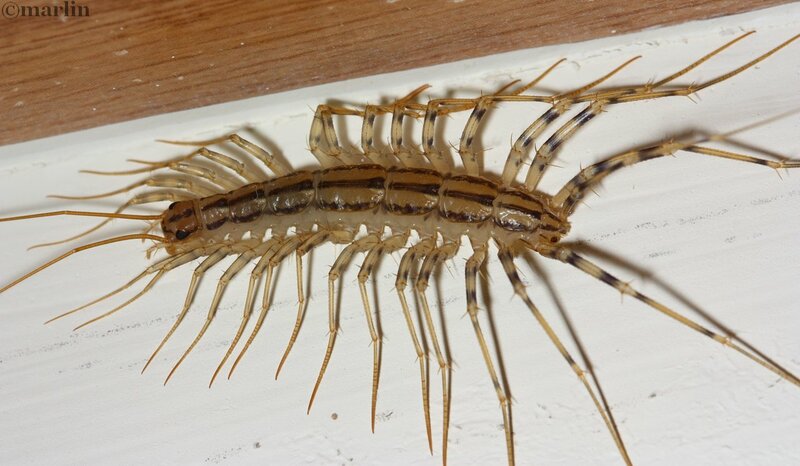 Houses built on a concrete slab poured directly on the ground, can have more of a problem with sow bugs or pill bugs if there is no moisture barrier under the concrete. Built-in planters are usually a bad idea for many reasons. Window box planters and planter boxes on decks tight against the house are good breeding places for many bugs. Make sure all your doors (ground level, to the outside) are weather-stripped. If your garage is attached or integral with the house, make sure those doors are properly weather-stripped also. Watch for obvious moisture problems in the garage and bottom level. Keep soil levels well below structural wood around the home. 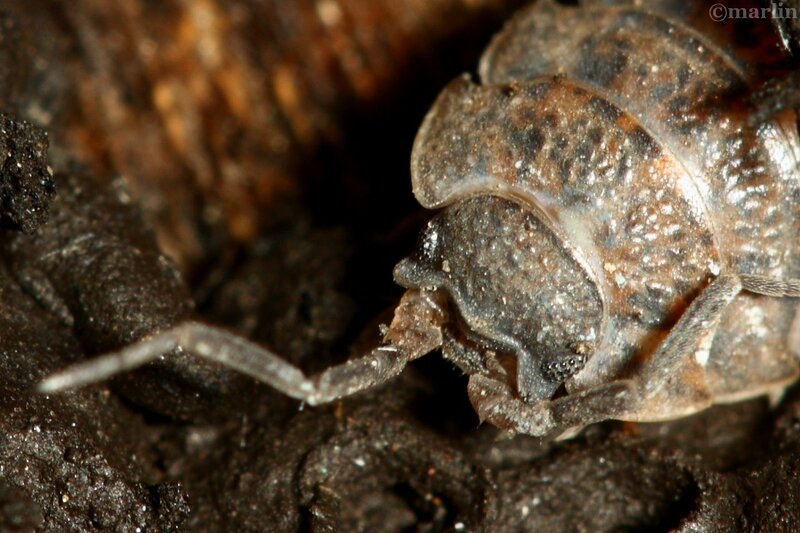 It becomes apparent when you see a pill bug roll up why their legs are constructed the same – so they will fold up inside the ball. This specimen is not rolled up all the way, otherwise there would be no interior parts visible – just a smooth, armored sphere.